Practice sight words, polysyllabic w/suffix words, and academic vocabulary with week 21 of K12Reader’s free 36 week spelling program for fifth grade. In this week’s spelling list, you will find the following 20 words: solstice, entered, Egypt, laughter, incidentally, whisper, chief, entrance, expensive, tentative, measuring, tolerating, nautical, replacing, forbidding, inquiry, eventually, accompany, abacus, and technique. Each of these words are included in the five printable activities that focus on reading and writing skills. 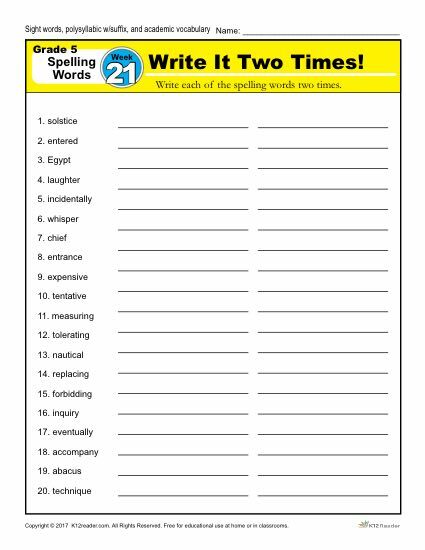 The printable spelling worksheets are: Write it Two Times, Dictation Sentences, Circle the Correct Spelling, Write a Sentence Part 1 and Write a Sentence Part 2. To get started, download and print the activities below. View the full 36 week spelling master list, click here.